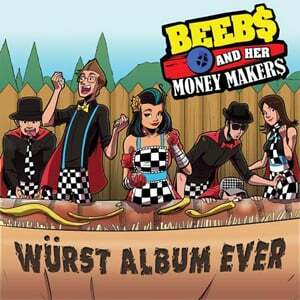 Naming your album “Würst Album Ever” shows the confidence in your band and your musical talents…or your undying love for hot dogs and sausages. Ironic as it may be, this release is far from “Würst Album Ever”. It is in fact one of the most fun and entertaining albums of this year. I’m fairly new to the BAHMMs scene, but upon first hearing them while on tour with Reel Big Fish and Five Iron Frenzy I dove head first into their musical catalog. Ever since then I’ve been hooked. For those unfamiliar with their sound think of early Dance Hall Crashers or Save Ferris, mix in some blues-y sounds of Amy Winehouse…and then add some kazoos. They remind me of some of the fun and goofy ska acts of the mid 90s…back before emo depressed the hell out of everything. What you have on “Würst Album Ever” is an eclectic mix of new songs such as “Truth”, “Out The Door” and “Death To Ego”…re-released and re-worked songs like “Beautiful Gloomy” which went from a jazzy blues song to an upbeat third-wave ska song and a heavier version of “Ms. Captain Kangaroo”…and they even manage to throw in a cover of TLC’s 1994 hit “Waterfalls”. Yessiree…you get a little bit of everything on this so-called “Würst Album Ever”. Some of the few standout tracks for me range from the new to the old. “Crazy” which features Aaron Barrett of Reel Big Fish fame is one of my favorite BAHMM’s tracks and I’m glad to see it find its way onto the full length release, “Out The Door” if a fun, energetic track that kicks off the album in style, I really enjoy the re-worked version of “Beautiful Gloomy”, “Truth” is well-written and one of the catchiest and most danceable ska tracks that I’ve heard in years, “Waterfalls” is a classic third-wave ska cover and they even bring out the funk with “Dialect On Preset”. When all is said and done “Würst Album Ever” is the best collection of Beebs songs yet. Their unique mix of blues and ska topped with their quirky style and sense of humor makes Beebs and Her Money Makers one of the most fun and likeable bands out there right now. No matter how you’re feeling…once you put on some BAHMMs you can’t help but crack a smile and dance along. Bottom Line: A great mix of old and new come together to make a very fun and entertaining listen.